The Department of Ethnic Studies at the University of Oregon would like to invite you all to the third annual Pacific Northwest Ethnic Studies Undergraduate Research Symposium. This is the first time it will be held at the University of Oregon. The conference will provide undergraduates with the opportunity to gain experience presenting their ideas, meet like-minded students and faculty, and learn about graduate school from graduate students of color. Our keynote speaker Dr. Gaye Theresa Johnson of UCLA César E. Chávez Department of Chicana and Chicano Studies, will deliver a talk, “Research In the Throes Of Empire, Or Why Your Heart Must Be In Your Work”. The symposium is open to the public and everyone is welcome. Come support our students and celebrate 50 years of ethnic studies! When: Friday, April 12th, 2019 from 9:00 a.m. - 5:00 p.m. Lunch will be served so please RSVP here so we may accommodate everyone who will attend. Deadline to RSVP is April 5th. Welcome! 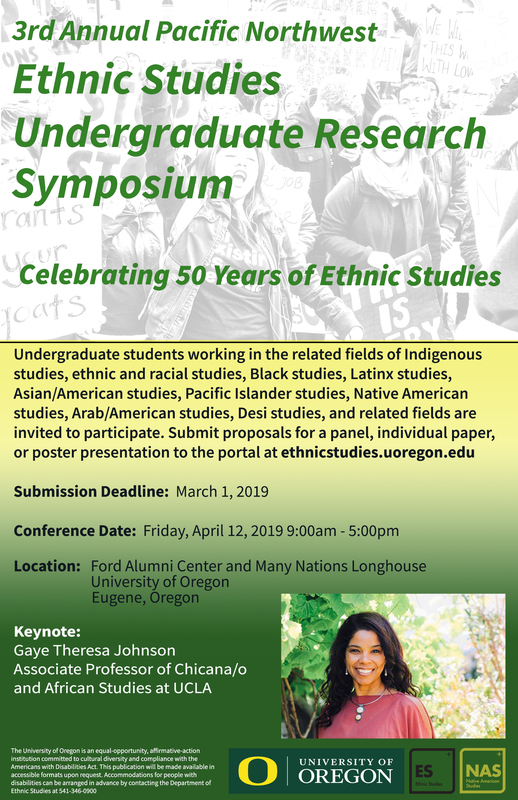 The University of Oregon’s Ethnic Studies Department invites undergraduate students from across the Pacific Northwest working in the areas of Indigenous studies, ethnic and racial studies, Black studies, Latinx studies, Asian/American studies, Pacific Islander studies, Native American studies, Arab/American studies, Desi studies, and related fields to submit their work to the 3rd Annual Pacific Northwest Ethnic Studies Undergraduate Research Symposium. This conference will provide undergraduates with the opportunity to share their work, gain experience presenting their ideas, and meet like-minded students and faculty. 1) Individual Paper Submissions: please submit an abstract of 150-200 words via the button below. If accepted, students will present a paper, approximately 10-15 minutes in length, and entertain questions from the audience. To the extent possible, papers will be grouped into thematic panels. 2) Paper Panel Submissions: for this submission type, prior to the application deadline, students should have coordinated with 2 or 3 other undergraduate students to present papers on a similar topic. For example, 3 students can decide to form a panel on Border Politics and present 3 individual papers on that theme, in the same session. If accepted, each student will present a paper, approximately 10-15 minutes in length, and entertain questions from the audience. To apply as a panel, please click the button below and indicate that your paper is part of a full panel, with the panel title or theme included your abstract and title. 3) Poster Submissions: please submit an abstract of 150-200 words via the button below. If accepted, students will display their poster and be on hand to answer questions for a designated 2 hour time period the day of the conference. More details are forthcoming. If you have any urgent questions about this submission type please email the conference graduate assistant, Maggie Newton, at mnewton@uoregon.edu. All accepted presenters and audience attendees will be expected to register for the conference prior to the conference date. Lunch will be provided the day of the conference. If you have any food allergies we need to be aware of, please email the conference graduate assistant, Maggie Newton, at mnewton@uoregon.edu. The conference organizers have reserved five rooms at the Phoenix Inn Hotel. Students will be responsible for paying hotel expenses. Each room has two queen size beds and can accommodate 4 students. If you are interested in staying there for the conference weekend, please email the conference graduate assistant, Maggie Newton, at mnewton@uoregon.edu by March 21st before 5pm. If you are presenting at the conference, or if you are a registered attendee, and will need special accommodations, or if you have any other questions or concerns, please email the conference graduate assistant, Maggie Newton, at mnewton@uoregon.edu.